If you’re looking for a high-end restaurant, with exceptionally well-cooked and beautifully presented food, then you are looking for Kitchen W8. As you approach the Kensington-based restaurant, you will be intrigued by its exterior: a smart black facade and awning, leaving everything to the imagination. Upon entering, Kitchen W8 instantly suggests that you are in for a treat, with it’s trendy and incredibly striking framed wall art and modern, sophisticated air. With the fresh, white tablecloths and stylish, yet comfortable looking furniture, you’ll feel instantly invited to come and be part of a positive dining experience. You’ll be hard pushed to find a vacant table here without a booking during prime hours, I would imagine, as even on a school night, the restaurant is packed with all walks of life. From groups of young professionals to romantic middle-aged couples, as long as you have style and class you are guaranteed to fit right in. It seems this is a highly popular place to be seen in Kensington. Kitchen W8 was practically guaranteed to be fruitful and full of elegance from the word go with the partnership behind the upmarket eatery. Philip Howard, holder of 4 Rosettes at The Square in Mayfair, and Rebecca Mascarenhas envisaged a neighbourhood-style restaurant producing top quality food. This forecast has most certainly been surpassed, with delicious a la carte and set menus to satisfy all tastes. This Michelin-starred restaurant has a delicious menu, offering mouth-watering dishes, including caramelised loin and croquette of Pata Negra pork with potato, apple and watercress, and roast Bresse pigeon with beetroots, bulgur wheat, hazelnuts and bacon. They offer a tasting menu to showcase the delicious foods available. It truly is the perfect stop off for an exquisite lunch or dinner, any day of the week. The high-end European cuisine will not disappoint. The wine list at Kitchen W8 will also leave your mouth watering. You can choose from a whole range of elegant wines to complement your dish, with around 20 wines being offered. There is a mixture of quirky, interesting wines, and also some more established popular choices. There is also a bring your own wine policy on Sunday evenings to keep things original. The whole atmosphere of Kitchen W8, despite its stylish interior, delicious food and quality service, is incredibly friendly and welcoming. It is evident to see why it is the number one choice for impromptu visits, regular diners and also big celebratory events. 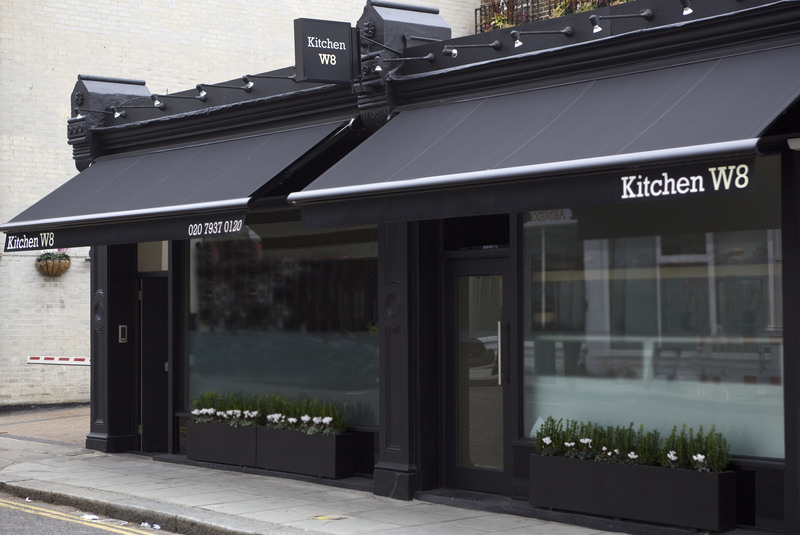 The name of the restaurant: Kitchen W8, is perfect. It is simple, yet intriguing. It doesn’t claim to be glitz and glamour, nor a fast food chain. The simplicity of the name complements the exterior of the building fantastically. It leaves you wondering what’s inside. I would go as far as to say that this restaurant is one of a kind in its area. A friendly, informal place to eat where you are guaranteed a great atmosphere night or day.